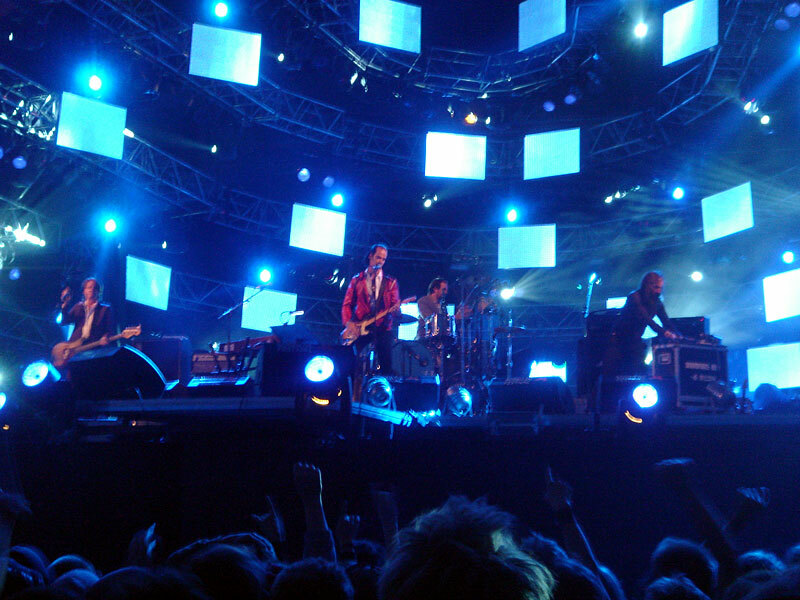 The programme described Polarkreis 18 as a German answer to Muse and Radiohead. And they did have the crystal-clear vocals of the former and the brooding chord sequences of the latter, but at times an infectious disco beat lifted their melodies to another plane. I wouldn’t be surprised if these guys made it to the Orange Stage one day. By chance I popped into Sidi Goma‘s show. The members of this troupe are Sidis – a black minority living in India (no, I hadn’t heard of them either). Their music was a great reminder of how all rhythmic grooves in modern music are actually descended from Africa. And in the Sidi culture, too, a musician is an all-round entertainer: All members of Sidi Goma played, sang and danced. I have no ideas what the performance was about (did they mime some sort of animal? ), but the music was funky as hell! Gnarls Barkley pleased the crowd at the Orange Stage. Funny to hear how the live band almost perfectly mimicked Danger Mouses’ programmed backing tracks on the album. And Cee-Lo’s soulful voice has just the right kind of sharp edge needed to cut through the controlled chaos of the groove. I’ve always thought of Danish Veto to be rather weak, synth-infused rock, but live their sound actually has quite an impact. However, they’re still let down by a sad lack of charisma and decent songs. Do Danish bands really think more in terms of concept than material? I’ve never really gotten into Kings of Leon, but their performance was a nice surprise. A simple, yet dynamic, grunge-inspired rock groove and truly memorable songs. Their sound had exactly the impact needed to capture the huge crowd in front of the Orange Stage. And then of course, the aptly named Grinderman. I’m a great fan of their debut album, and Nick Cave and the guys managed to recreate the magic live – among other things confirming my view that the laid back groove of “(I Don’t Need You To) Set Me Free” can get the crowd going just as much as the faster songs. But excuse me, didn’t Warren Ellis once look like a nice, normal guy? When did he transform into this bearded, Rasputin-like madman, jumping around the stage, pushing buttons and banging a cymbal with his maracas? But a fitting icon for a truly untamed rock sound. And finally, Mike Skinner of The Streets demonstrated that he’s not only a talented musician/rapper/storyteller. He’s also a brilliant entertainer, seamlessly weaving jokes and crowd-activating comments into the songs themselves. Not an easy feat. Maybe he’s actually painfully smart underneath that disarming London lad exterior.